Greetings! My name is Cassie Carter, and I am the webmaster--or webmistress, or webmonster, or Chief Cook and Bottle Washer, whichever you prefer--of Catholicboy.com. I live in New York City and work as an information architect and interaction designer (IxD); my portffolio is at CassieCarter.com. How I got where I am now is a long story, but no matter how disjointed my biography may seem, Jim Carroll always fits in there somehow, and Jim remains as essential to me today as he was when I first "discovered" him back in 1987. I began developing websites when I created the Jim Carroll Website at the tail end of 1995, while I was finishing the coursework for my PhD in English at Bowling Green State University in Ohio. I developed what is now CatholicBoy.com after I contacted the webmaster of Literary Kicks, a site devoted to Beat Writers, about expanding his section on Jim Carroll. He suggested to me that a Jim Carroll website might be cool. I thought that was a novel idea . . . so I started learning HTML by viewing the HTML sources of my favorite websites (I started with Babelogue, the Patti Smith website) and talking to colleagues who were experimenting with the web. For more information about the development of the website, please check out the About this Website page. I completed the first "draft" of the website while enjoying a "non-service" fellowship at Bowling Green State University. "Non-service" means that I wasn't teaching any classes. I was completing the research and notes for my PhD dissertation, which had nothing to do with Jim Carroll. After completing my doctorate and a two-year term as full-time visiting assistant professor in Michigan State University's department of American Thought and Language, I moved to New York City in July 1998 to get in on the gold rush that was the internet in those days. You can read about my web development career on my professional website. It all makes perfect sense, right? My doctoral specializations are in contemporary American fiction and drama, women's writing, and culture studies. My dissertation, entitled "'Woman, Red in Tooth and Claw': Angry Essentialism, Abjection, and Visionary Liberation in Women's Performances," examines the performance art of Karen Finley and Holly Hughes in order to define "Angry Essentialism." I coined the term "Angry Essentialism" to describe a recent movement in feminism that champions the "bad girl" side of the Woman/Nature equation as a site constituting power for women. Hey, web development was a logical career choice. That was irony, in case you missed it . . . But back to Jim Carroll. The first time I ever heard of Jim Carroll was in a "rock poetry" course at San Diego State University. (Remember that I ended up at Bowling Green State University, home of the popular culture movement, and now you know why.) My professor, Larry McCaffery , offhandedly mentioned some guy named "Jim Carol" (as I wrote in my notes) and his album Catholic Boy. I made a note of it, spelling Carroll incorrectly, of course. But I didn't follow up on this lead until a year later. I became interested in Jim Carroll in 1987 when I was taking another course with Larry McCaffery a year later. This was a course in contemporary American literature at San Diego State University. I had just completed my BA in psychology (with an English minor) in May, but I found myself just as interested in literature as I was in psychology. I was at a turning point, when I could have gone either way. I was taking courses in American literature in the English department, and statistics in the psychology department, when my literature professor, Larry McCaffery , told me about The Basketball Diaries. At this stage, I read anything Professor McCaffery suggested, and I picked up The Basketball Diaries thinking, oh, god, I can't handle sports. I thought it would be a book about basketball. I was about 50 pages into The Basketball Diaries when I saw a flyer announcing that Jim Carroll would be coming to SDSU's BackDoor club for a reading; I immediately bought a ticket (I think it was $4). That evening, November 13, 1987, changed my life. To make a long story short, seeing Carroll in person showed me the power of words, and particularly the power of spoken word. Watching Jim on stage, I saw him metamorphose: he was a tall, pale, thin man with long red hair and his shoes untied; he was a 13 year old street punk shooting hoops on the Lower East Side; he was a rock star on stage; he was a poet handling words like explosives. He was mesmerizing. Suddenly I realized that here is a man who has literally created himself through writing. Seeing Jim clinched my decision. Because I hadn't majored in English, I consulted with the graduate advisor in SDSU's English program to see what I needed to do, then I took more literature courses so that I could enter SDSU's MA program in English in August 1988. I was awarded a graduate assistantship (I was thrown into the classroom as a teacher with NO training in teaching). I taught four sections each of beginning and intermediate composition and attempted to work the bugs out of my teaching methods as I went along. Meanwhile, I continued working with Dr. McCaffery , who became my mentor and role model--click here to see his list of the best fiction of the 20th century and you'll know where I'm at, too. Like Larry, I specialized in contemporary American literature. In this field, during my first semester, I began working with Dr. Dorothea Kehler on an annotated primary and secondary bibliography of Jim, which I published in Bulletin of Bibliography in 1990. I am eternally grateful to Dr. Kehler for her enthusiastic support of my work--she is still excited about my work! Dorothea Kehler, like Larry McCaffery, is one professor and influence I wouldn't trade for the world. I spent two years researching my bibliography of Jim Carroll (under Dr. Kehler's guidance), and in the process I received help and advice from many people, including Jim's ex-wife, Rosemary Carroll, and her assistant, Karen Pals; Janet Kraybill at Viking Penguin; Matthew Bailer at the William Morris Agency; Anne Corrigan at New World Video; Joe Selby at BAM, and, most importantly, from Jim himself--he gave me the specifics no one else could have provided. Although I had attended three of Jim's readings before in 1987 and 1988 (at one of which I actually had enough courage to shake the man's hand and, with glazed-over eyes, tell him: "I think you are a genius"), I talked with Jim for the first time on July 7, 1989, at the Spirit club in San Diego. He was there for a reading, and Rosemary had arranged for me to talk with him. After the show, I made my way back to the green room, where Jim was signing autographs for adoring fans. I introduced myself and started asking him questions--like where I could get his first book, Organic Trains. He pulled out a copy of the book and gave it to me. Only about 500 copies of Organic Trains were printed, and about half of them were "lost" by the publisher. This copy of Organic Trains, which Jim gave to me, is one of my most prized possessions. If there was a fire, I'd grab my birds and this book. I have a lot of other neat goodies I'd want to throw into the rescue bag, but this copy of Organic Trains is priceless to me. In any case, at the time of this first meeting, I was teaching freshman writing courses at San Diego State University, and my students (who were required to keep journals), having read The Basketball Diaries, had composed questions about the book. Now, I had prepared a set of interview questions for Jim, and I had put them in another folder. But when I got to the greenroom at the Spirit Club, I discovered I'd brought the wrong folder to the reading. I had brought the folder containing my students' questions. So anyway, eventually, to make a long story a little shorter, Jim bummed a ride off me back to his motel, so I had the chance to talk with him for about an hour. Many of the magazine publications listed in my Bulletin of Bibliograpy article are there thanks to Jim's help, because I wouldn't have found them without his assistance. After I completed the bibliography, I finished my 200-page master's thesis on The Basketball Diaries and Forced Entries, completing my master's degree in December of 1990 under the guidance of Larry McCaffery. While I was working on the bibliography and thesis, I had one of the most vivid dreams of my life, and it was about Jim Carroll and my work about him. If you want to read my description of this dream--straight from my diary--click here. “Jim Carroll.” Contemporary Authors: New Revision Series. Ed. Scot Peacock. Vol. 115. Detroit: Gale, 2003. 56-61. “Jim Carroll.” Contemporary Literary Criticism. Ed. Jeffrey W. Hunter. Vol. 143. Detroit: Gale, 2001. 25-54. ”The Sickness That Takes Years to Perfect: Jim Carroll’s Alchemical Vision." Dionysos: Literature and Addiction 6.1 (Winter 1996): 6-19. Rpt. in Contemporary Literary Criticism. Ed. Jeffrey W. Hunter. Vol. 204. Detroit: Gale, 2001. 40-46. "Jim Carroll: An Annotated, Selective, Primary and Secondary Bibliography, 1967 – 1988." Bulletin of Bibliography 47.2 (1990): 81-112. 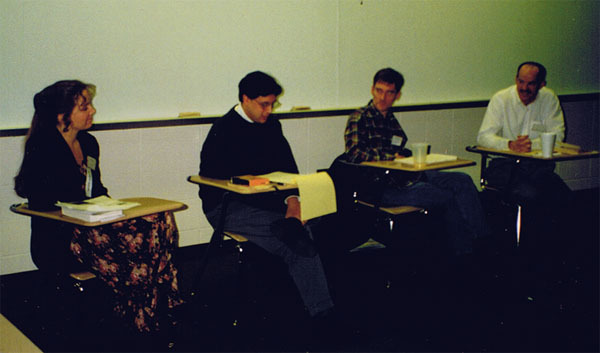 I have also presented conference papers on his work (including one on "Tiny Tortures"), and in November 1996 I united the main Jim Carroll scholars for the first time on a panel devoted to Jim's work at the Midwest Popular Culture and American Culture Associations' conference--I was a Program Director of this conference from 1993-1996. To backtrack a bit, after I had completed my MA thesis and graduated in December 1990, I got to meet Jim again, this time at Cafe Largo in Hollywood, CA. He was doing back-to-back readings there, so following the first reading I approached the bartender and asked him to give Jim a message from me. At just that moment, Jim reappeared and began fixing himself some coffee. I went up to him and introduced myself, but he already knew who I was. He actually remembered me. I followed him back to the green room (I also had one of my students with me) and talked to him for about an hour there. Actually, I made him late for his second reading. The amazing thing about this meeting was that he was discussing, from memory, things I had said in letters to him over the previous two years. A few years later, around the same time I launched this website, I singlehandedly brought Jim to Bowling Green State University on February 20, 1996; if you want to know how I did it, see How I Accomplished the Impossible. A nice bonus in this accomplishment was that I also got to hang out with Jim for two days. That's when I started referring to him as "Jim," by the way, partly because Jim's booking agent kept teasing me for referring to Jim as "Carroll" or "Mr. Carroll," and partly because Jim is such an informal, unassuming person that no matter the conventions of literary scholarship or my deep respect for him as an artist, in person it's almost impossible to avoid calling him anything but "Jim" without feeling silly. I still refer to him as "Carroll" in my scholarly work. In any case, Jim--or Mr. Carroll, if you prefer--gave me a "greeting poem" for the website while we were sitting in the Toledo airport waiting for his delayed flight back to New York. Another time, in February 1998, when he gave two readings in Ann Arbor and Detroit, Michigan, Jim surprised me. I had brought a couple of letters from fans to give to him (since it was easier than forwarding them by mail, like I usually do), and when I said, "Jim, I have some stuff for you," he said, "I have something for you, too." He had brought me a copy of the new edition of The Basketball Diaries and a color photocopy of the new cover art for Fear of Dreaming. I thought it was nice of him to think of me, especially when he hadn't seen me in nearly a year. Oh, and he also noticed right away that I'd dyed my hair red. Another interesting meeting was in March 1997, when I had the pleasure of seeing him perform an actual concert with Lenny Kaye at Cornell University. After the show I went out for a late dinner with Jim and Lenny. Later on, after Jim had headed back to his motel, I was Lenny's partner in a game of pool. We won, no thanks to me. My favorite Jim Carroll encounters have taken place in New York. The first was on the weekend of January 24, 1997. It was my first "real" visit to New York, and Jim invited me to his place. He showed me his computer, photo albums and scrap books. Another memorable time was on November 13, 1999. Jim did two shows at the Bottom Line and afterwards we walked across Manhattan, talking about silly stuff. I can't imagine a better way to celebrate the 12th anniversary of the first time I saw him (in San Diego) and the 9th anniversary of the completion of my master's thesis about him. Since 1996, and especially after I moved to NYC, my relationship with Jim developed into a cherished friendship. I talked to Jim almost every week about upcoming shows, completed gigs, his books, his past, day-to-day stuff, whatever. During the summer of 2009, I spent a lot of time with him at his apartment in Inwood, helping him to organize the final revisions of his novel. On September 9, I sent him a text message letting him know I was on my way to the airport and would return in ten days. He replied with a text message asking me to be sure and call him as soon as I got back, closing with a note that his "new fav" song was "Brown-Eyed Girl" by Van Morrison -- a direct reference to his own poem "Jukebox." Two days later, Jim was gone. I wish I could share Jim Carroll as I know him. This website is my best shot.